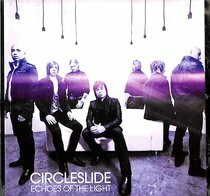 :Circleslide's unique blend of pop, rock and blues along with heavy touring for the last eight years have earned them the reputation for being one of the best live bands of Christian music. The band was developing Echoes of the Light in May 2010 when Nashville was hit with a devastating flood which destroyed all of the band's gear, instruments, PA and trailer. Circleslide's ordeal, and the season of spiritual reassurance which followed, directly inspired the band's recent songwriting. 'Circleslide' was originally birthed out of YWAM where Gabe Martinez and his wife Debbie served as missionaries. About "Echoes of the Light"
Circleslide's origins date back to Gabe's time spent throughout the 1990's serving at Youth With A Mission (YWAM,) an outreach program seeking to convey the gospel with relevance to teens and young adults. The Arkansas based assignment as a musical leader helped refine both his vocals and guitar playing, eventually attracting bass playing brother, Tim, into the organization. The guys moved to Missouri and resumed playing concerts throughout the Midwest where they eventually met Circleslide's guitarist Aaron Gillies, then adding their final member, drummer Mark Alvis.